We increasingly access the Web from our mobile phones, especially now that the rise of smartphones is making it easier than ever to get a decent web experience on the small screen. However, the highest share of mobile web usage isn’t in the most developed nations, but rather in the developing nations of the world. It’s important to note that these numbers are averages. Individual countries can and do differ greatly, as you’ll see further down. It is a bit ironic that mobile web usage is, relatively speaking, lower in Europe and North America than in much of Asia and Africa. At least when you consider all the attention that Android, iPhone, and smartphones in general are getting over here. Worldwide, mobile makes up 3.81% of web usage according to StatCounter. And just to clarify, with the mobile Web we mean the Web accessed from mobile devices (usually phones). The numbers in this article are for the month of October, 2010, and all come from StatCounter, based on visitor statistics from more than three million websites. Both Asia and Africa are big places, so let’s look closer at which specific countries are lifting the averages in those regions. Several African countries have in excess of 20% of web usage coming from mobiles. Nigeria, for example, has just over 25%, Sudan just over 22%. But they don’t match Chad, which has close to 29% mobile web usage. In addition to these, there are several countries with just under 20% mobile web usage, for example Kenya. High mobile web usage is not uniform in any way across Africa. There are several countries with mobile web usage far below 10%. Several Asian countries, like India, Indonesia, Cambodia, Turkmenistan and Bangladesh, hover around 15% mobile web usage. Nokia phones dominate in these countries. In every single one where mobile web usage makes up an unusually high share, Nokia’s Symbian OS completely dominates. In some countries more than 90% of the mobile web traffic comes from Symbian phones. In others, it has a more “modest” market share of 60-80%. After that are usually phones from Sony Ericsson and Samsung. 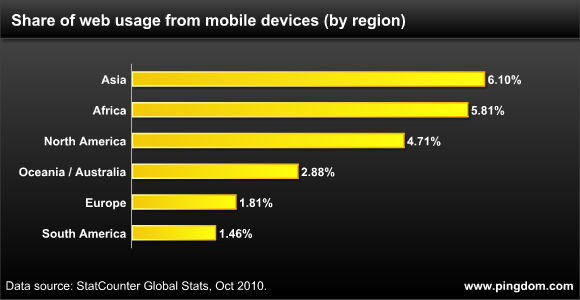 Smartphones sporting Android, iOS or RIM’s Blackberry have tiny market shares in these countries. One exception to the above point: Indonesia, where RIM’s Blackberry accounts for more than 31% of the mobile web traffic. But it’s still second to Nokia’s Symbian. The reason these countries have such high mobile web usage compared to desktop web usage (for lack of a better name) is very much a result of economics. A large portion of the population won’t have access to the means needed for a computer and Internet access. A relatively cheap mobile phone (most often from Nokia, as we have seen) will then be a much more realistic option, and it therefore becomes the way to reach the Web for many. It’s either that or no web access at all, so it’s a matter of necessity. So that’s why mobile makes up such an unusually large portion of the web traffic in some countries. It’s not a matter of being on the cutting edge. Even in Japan, arguably the most advanced country on the planet when it comes to mobile phones, mobile only makes up 2.17% of web traffic. This is sobering data to the western-based tech media who bombard my rss reader with gushing stories about iOS and Androids. In fact, outside the US and parts of EU, iPhones and iPads are virtually nonexistent. And reports of the demise of the Symbian platform is exaggerated. Let’s also look at the cost. Belgium, where I live, is one of the most expensive countries around when it comes to internet access. Have a look at the prices for mobile internet and you’ll quickly understand why many don’t use it. I don’t even know what the prices are, as I don’t use it, and I know nobody who does (well, except for 1 guy, who uses his blackberry company phone). When I connect my Android based phone to the net, it’s over a wifi connection, not via “mobile internet”. Another economic factor you forget is the cost to implement infrastructure. Running miles of cable or fiber-optic is simply out of the question, especially compared to the relative cost of erecting a cell tower. I live in india, 70% population of india lives in villages and their only option to access internet is cellular EDGE connection. Broadband connection are available by government company-BSNL but their prices are comparatively high. Normal person goes online two times a day and that even not from computer but on the go. Mobile is convenient for them , they dont just want complications of use for computers. Mobiles are easy & portable. I think most of the people in asian country loves the mobile phones rather than the desktop computers. Mobile usage in Africa and Asia will surely out number western countries as their populations are quiet considerable and wired infrastructure is too expensive.